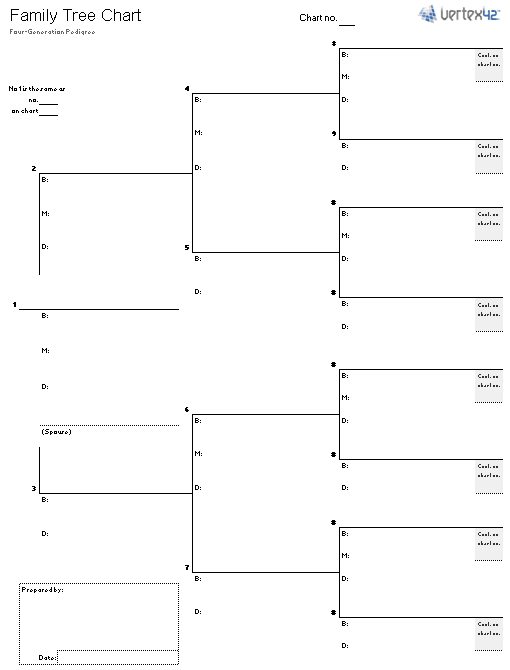 Download a Free Family Tree Template or a Printable Blank Family Tree Chart !! 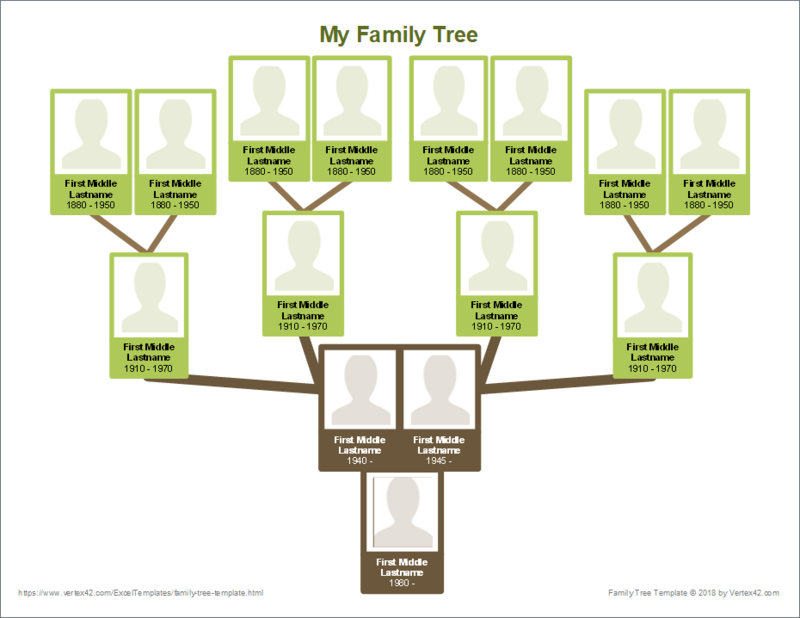 Whether you need to make a family tree for a school project or you want to get serious about researching your family lines, the first step for any genealogy project is to start with a family tree. 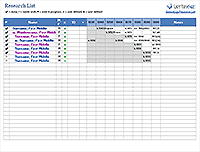 Vertex42's Free Family Tree Template (also known as a horizontal family tree pedigree chart) will help you quickly organize your family information. Choose from a few different formats and styles. If you wish to simply record information by hand, then download one of the printable blank family tree charts. Continue reading below the download block for additional tips on creating a family tree as well as links to other genealogy resources. 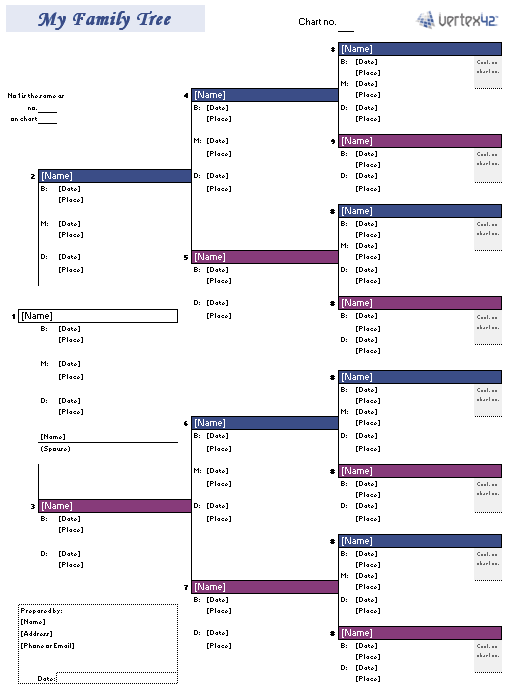 These blank family tree charts will help you to hand-record your family history - great for class handouts. 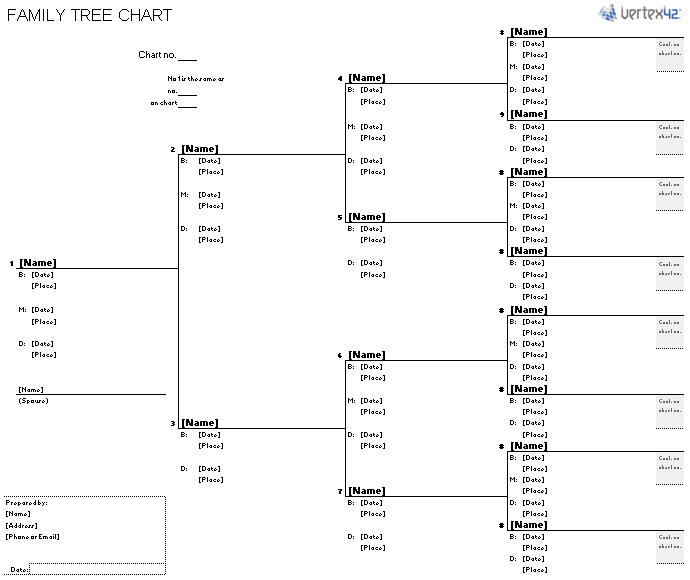 These can be used to create a family tree diagram for simple 4-generation family tree project, or you can cross-reference multiple family tree sheets for larger projects. If you want to save your work, we'd strongly recommend that you use our Free Family Tree Template or some other family tree software (see some of the resources below). 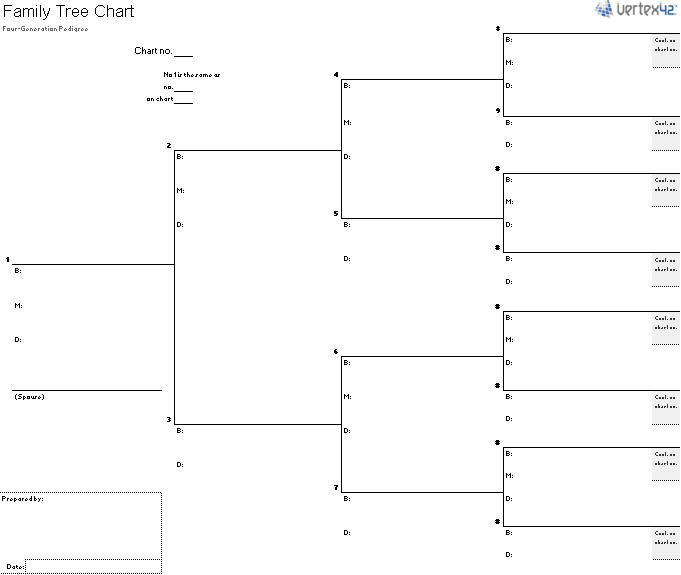 Description: This family tree chart template for Excel and Word allows you to easily insert photos from your computer. The tree looks great with photos added. In case it's not obvious, you start with yourself at the base of the tree, enter your parents in the two spaces in the upper part of the trunk, and work up the branches from there to list grandparents and great-grandparents. 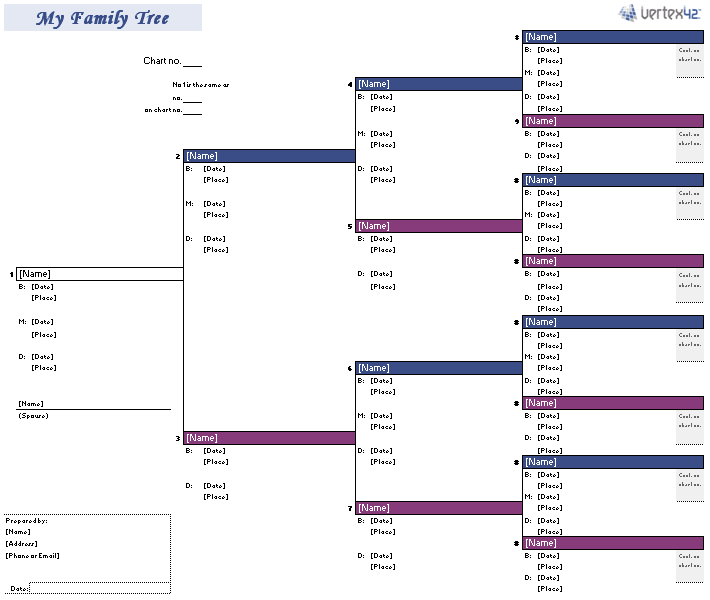 These Excel-based Family Tree Templates are great for creating multi-generational family tree pedigree charts. 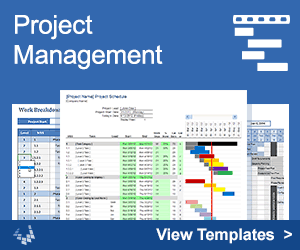 The Excel workbook contains 2 different styles and orientations. See the screenshots on the right. It also includes the blank family tree charts used to create the PDF's listed above and the example Kennedy Family Tree shown below. This is an example of a four generation family tree based on John F. Kennedy and family, created using the family tree template. Ask your relatives for help using their memories and family documents such as Bibles, birth and marriage certificates, journals and military records. Review other websites to see what others have discovered about your family lines. Be careful as some of the family trees on line are not accurate. Check their sources. Focus on primary sources such as copies of birth, census, death and marriage records. Many of these are available on line for free or a nominal fee. Be patient – it can take a long time to uncover your genealogy. Family Tree Fan Chart (PDF) - marthastewart.com - An interesting variation on a typical family tree formatted in the shape of a fan and covering five generations. 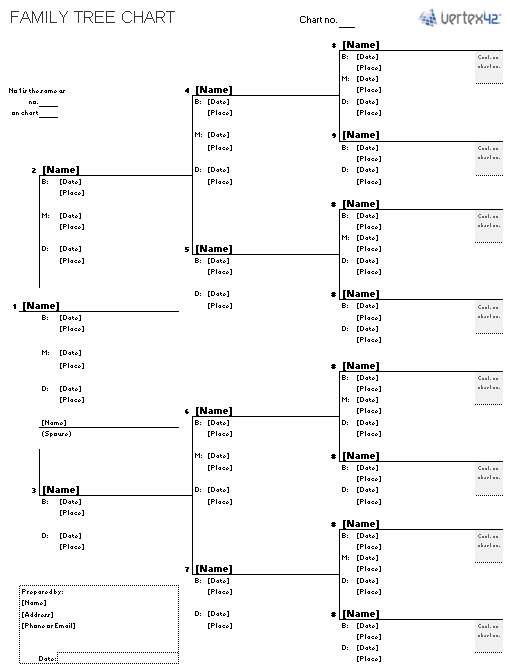 Genealogy Charts and Forms at CyndisList.com - The ultimate collection of links to genealogy resources, including a lot of places that provide family tree charts and templates. Graphical Family Tree - genealogy.about.com - A fun family tree that actually looks like a tree. Great for simple school projects and kids activities. Free Family Tree Software - myheritage.com - One of several great family tree programs available online to help you record and navigate through many generations of information. Ancestry.com - A vast collection of online original data including family history documents and family trees. (May be subject to fees). Free Family History Course at byu.edu - A free independent study course on how to get started with family history from BYU. Family Search at familysearch.org - The largest collection of original source material available free. You can also create Free Online Family Trees. FamilyHistory101 at progenealogists.com - A site with a lot of guidance and instructions for genealogists.